East Deerfield—Twenty Two Years Ago Today. On January 13, 1997, I exposed this Fujichrome Provia slide of Guilford’s EDWJ ready to depart Boston & Maine’s East Deerfield Yard (Massachusetts). 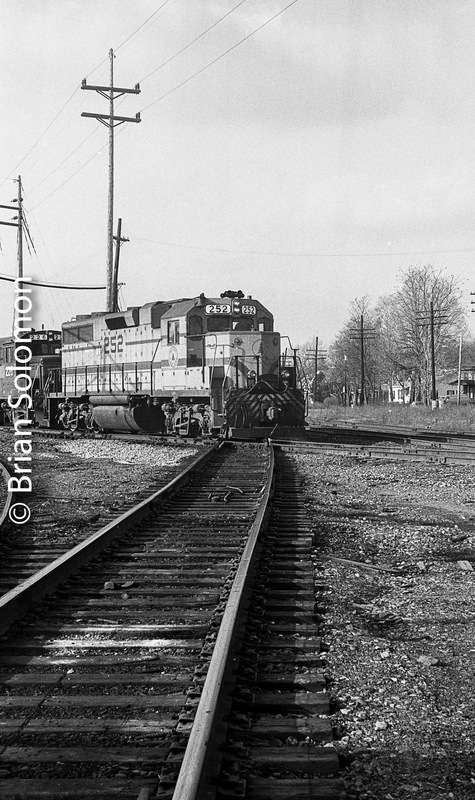 This was two years prior to the Conrail divide and at the time East Deerfield was a relatively quiet place. I was working with my N90S fitted with a Nikkor 80-200 AF zoom lens. 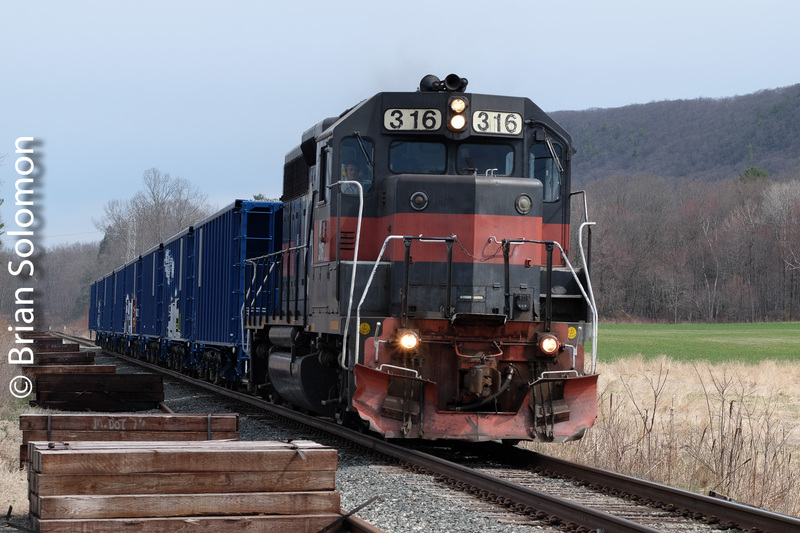 Pan Am’s ED-4 Rolls Ballast on the Connecticut River Main Line. For nearly 35 years, locomotives have worn Guilford gray and orange paint. The scheme is has been out of vogue since introduction of the new Pan Am liveries about ten years ago, yet a few of the locomotive are still working in the old paint. I made these views of GP40 316 working local freight ED4 hauling state-owned ballast cars southward at Hillside Road in South Deerfield. Is this tighter version a better photograph? Exposed using a FujiFilm X-T1 with 90mm Fujinon telephoto lens. I opted for the ‘darkside’ angle in order to better feature the hills in the distance (that make this a distinctive location) as well as the tie-piles that indicate the improvement to the track is on-going. This Day 12 Years Ago—An old GP9 on the Move. On this day (February 19, 2006), I exposed this photo of Guilford’s ‘Sappi Job’ at Fairfield, Maine. In the lead is an old Boston & Maine GP9 that had been built in 1957 using some trade-in components from World War-II era FT diesels. I was traveling with Don Marson and Brian Jennison and exposed this view on Fujichrome with a Nikon F3 with 180mm lens. Last weekend, I was making use of that same lens to photograph Ireland’s Bord na Mona narrow gauge railways. 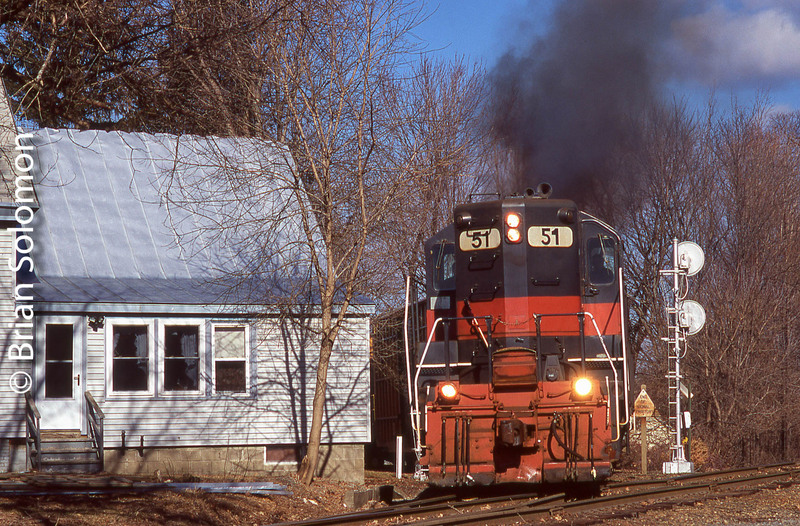 On the morning of February 19, 2006 (12 years ago today) Guilford Rail System GP9 51 leads the ‘Sappi Job’ off the old Maine Central Hinckley Branch at Fairfield, Maine on its way toward Waterville. Note the vintage GRS searchlight to the right of the locomotive. Mechanicville, New York; Then and Now Part 1. Back in the mid-1980s, my friends and I made trips to Mechanicville, New York where the adjacent Boston & Maine and Delaware & Hudson yards lent to lots of action and a great variety of diesel locomotives. 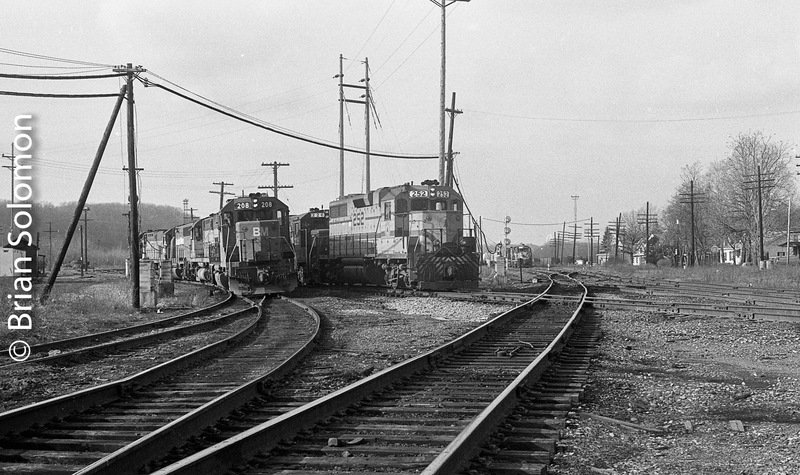 The yard was an early casualty of Guilford’s short lived consolidation of B&M and D&H operations. By 1986 the yard was a ghost town. 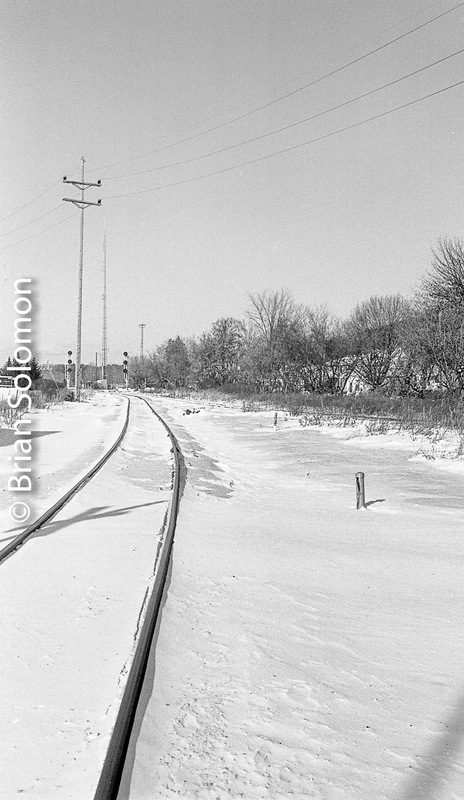 In December, I returned to Mechanicville with a Leica IIIA and Sumitar loaded with Kodak Tri-X in an effort to recreate the angles of photos I exposed in November 1984 using the same camera/film combination. To aid this exercise, I scanned my old negatives and uploaded these to my iPhone. The viewfinder of the Leica IIIA presents difficulties as this is just a tiny window and not well suited to precision composition. (Topic for another day). Also complicating my comparisons was the fresh layer of snow in the 2017 views. In some places the only points of reference between ‘then’ and ‘now’ views are the electrical lines crossing the yard. Horizontal view from November 24, 1984. An eastward B&M freight is about to cross the diamond with Maine Central 252 in the lead. Nearly the same angle in December 29, 2017. December 29, 2017 at the same location. 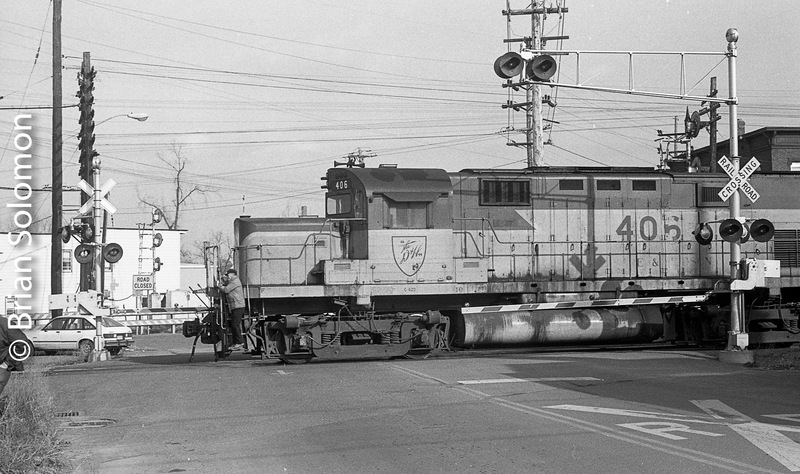 Delaware & Hudson C-420 406 crossed Viall Avenue in Mechanicville, New York on November 24, 1984. Looking east at Viall Avenue on December 29, 2017. 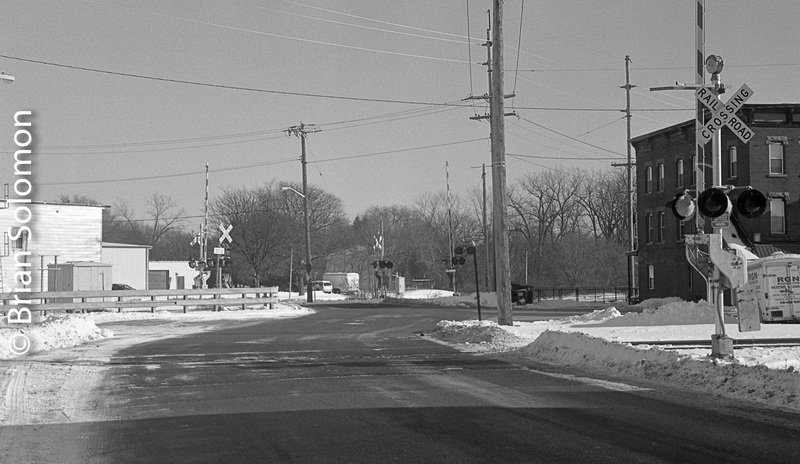 Note the change of grade crossing signals. At the End of the Day; Twilight at Mechanicville, New York. Here’s a photo from my lost archive. 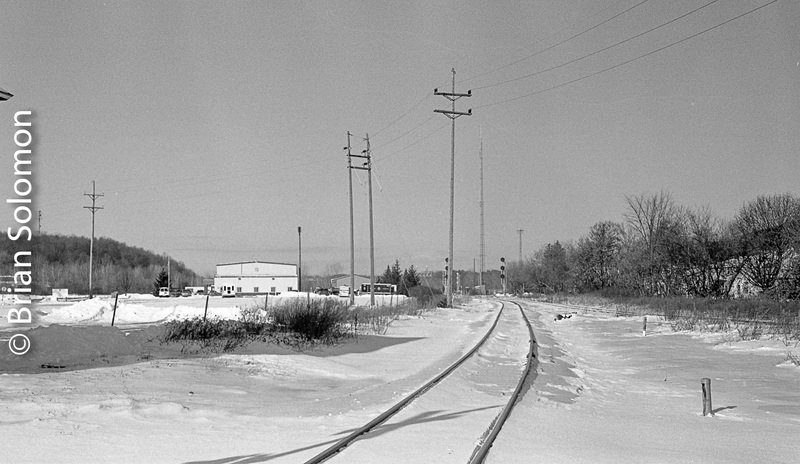 I’d spent November 24, 1984 with some friends exploring railroads in the Albany area. Delaware & Hudson had recently been included in the Guilford network and its operations were being melded with Boston & Maine. At the time, D&H still had a lot of old Alco diesels. 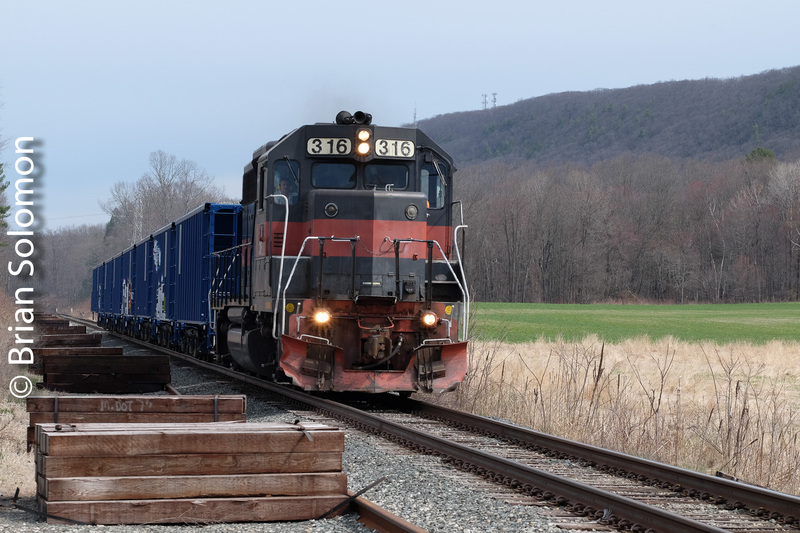 We had stopped by Mechanicville earlier in the day, and I made a selection of photos (that I’ll post at a later date) then we drove via Schenectady to Rotterdam Junction to photograph Conrail. On the way back east, we made another visit to Mechanicville, when I exposed this twilight view. This is an evocative image that represents a symbolic twilight as well as a literal one. Exposed with a Leica 3A on Kodak Tri-X, processed in Kodak D76 1-1. It was twilight for the D&H Alcos; twilight for the old Mechanicville Yard; and twilight of the brief colorful and busy era on Guilford before a series of strikes changed everything. Norfolk Southern SD70 2561 leads the westward empty Mt. Tom coal train at Hoosic Falls, New York on October 13, 2001. Exposed on Fujichrome Sensia 100 with an F3T with 24mm Nikkor lens. Shortly before the train entered the scene, a cloud diffused the sun. . . . Hey Tim, what was that you said just then? Picking photos for Tracking the Light can be a challenge. Everyday since March 2013 I’ve posted original photos to this site. That means, come rain or shine, I’ve selected photos and put words to them. For this post, I though I’d try something a bit different. Rather than work from my semi-organized labeled material, I selected a random box of raw and unsorted slides and just plucked out a photo randomly. While not the best picture in the box, frame 22 isn’t a bad photo. I made it on the afternoon of October 13, 2001. Mike Gardner, Tim Doherty and I had been following an empty Mt Tom coal train since it left the plant near Northampton, Massachusetts. We caught it a multitude of locations on Guilford Rail System’s former Boston & Maine. And so there you go! Random Slide Number 22, displayed and explained.